Malaysia, especially within the Klang Valley, has been flooded with BBQs around the world. Typically Korean. We have BBQ Plaza, Dao-Rae, Seoul Place, Bulgolgi Brothers - just to name a few famous ones. Of course, there are several Japanese BBQ restaurant around but hardly anyone care about them - or at least that's how I see it. Yaki Niki Ishiya is a new addition to the Japanese BBQ restaurants. Located deep within the Encorp Strand, behind those weird looking "tree-like-structures". Yaki Niku Ishiya serves not only Japanese BBQ but Japanese ala carte such as Ramen and bento set as well. Our own personal pair of tongs. Everything looks clean and neat. Not oily nor disgusting. Which is a good sign. Kick-started with a cup of long cheese sticks. Crispy, chewy and cheesy right through the core. A great appetizer indeed. Our second serving was the glorious Golden Dragon Maki. Its literally a tempura-styled prawn maki with fish roe and mayonnaise. Simple but well executed - rich in both texture and flavour. A simple set of rice, wagyu beef and miso soup - great for lunch. The Wagyu beef was a little on the sweet side, due to the sauce and a little chewy. I have always wondered why would the Japanese rely on marination of sauce when the beef is so flavourful. Nevertheless, it goes great with the shredded egg rice. Assorted tempuras with your typical selection of eggplant, crabmeat, prawns, sweet potato, mushrooms and sometimes, spaghetti strips. The one that looks like a peacock feather is made from angel hair, which I find it quite interesting. Batter-wise - it was crispy and fun to eat. The portion served was actually satisfying. Plenty of bean sprouts with a generous portion of soft, juicy and succulent chicken. The chicken was cooked in plenty of butter - and I do mean more than usual, which gave that strong buttery taste. They were also generous with the seasoning of salt and pepper which made everything quite salty. It goes great with rice but I definitely can't just eat it on its own. The BBQ Promotion includes 2 servings of garlic rice and a salad. However, you will only be entitled to pick 3 out of 5 of meat. Ranging from the photo above. So, pick wisely. Anyway, my selection of meat would definitely be the beef slices, NZ Lamb and of course, smoked duck being my favourite. The duck was filled with natural juices and flavour. An absolute delight to be taken with the garlic rice. Thick and succulent slices ready to be BBQ-ed and eaten. Last but not least, dessert. 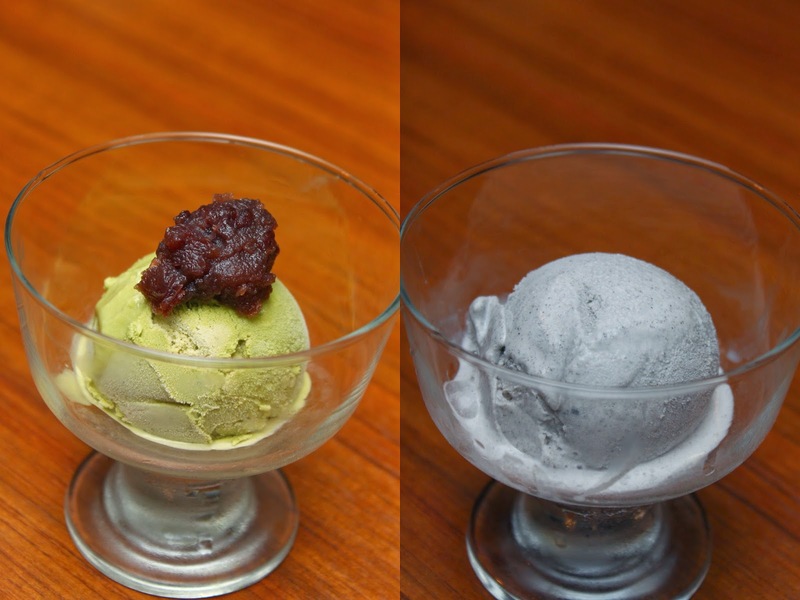 Without a doubt, a Japanese restaurant by default should have the above desserts - green tea and/or black sesame ice cream. Priced at RM8 which is quite reasonable, comes a scoop of your selected ice cream. The green tea was a falling more to the sweet side rather than a bitter-ish green tea after taste which I dislike. However, the Black Sesame Ice cream was pretty good. Quite a depth of flavour and rich sesame taste. I wouldn't mind going for seconds on this. In conclusion, I would say that the BBQ section of the menu was pretty good and up to expectations. The ala-carte selections has its doubt but most of them were pretty okay. Just some minor improvements needed here and there. The restaurant in general was really clean for a BBQ restaurant - most of them I've visited does not have this level of cleanliness. So rest assure, all the ingredients prepared are fresh and some are even imported!